Pelly gets teased at school for her fluffernobbin. All the other kids have tentacles on their head. Pelly decides to try and be like the others, but a visit from an opera star helps Pelly realize it's better to be herself, and it is ok to be different.Deals with something all kids will deal with at some point or other. Offers a great conversation opener for kids about differences and teasing. Kids will also probably like the delivery with the funny martian vocab and the creative scifi setting. We picked this book up from our public library.This is episode 2 in the series of First Graders from Mars. Me and my son read book 1 where we met Horus and of course Pelly was introduced to us as being the new alien in town.In this episode you read about Pelly and how she thinks she is weird, her family is weird. It doesn't help that another alien named Tera is a bully. Who likes to stay mean things. Me and my son both enjoyed how Horus stood up to Tera for Pelly. My son doesn't like bullies and kept letting me know he would give that alien a wedgie for being mean. While Pelly and her family have fluffernobbin's on their head she eventually learns that being different is a good thing and this lesson comes to her from the diva that is coming to their classroom. Not everyone wants to be the same even though it may seem that way, but with everyone being different it shows that everyone is unique in their own special way. We've read three of the four books in the First Graders From Mars series of books by Shana Corey and Mark Teague. They are crazy and funny and still manage to teach a lesson and we've enjoyed them all. We are looking forward to reading the last book, but wish there were more. This tale shows how it can be a good thing to be different and that trying to fit in with the crowd doesn't always work out. With tenticles and fluffernobbins being the highlighted differences in this tale, children can understand the concepts of different races, ethnicities and cultures in an objective and humorous way. 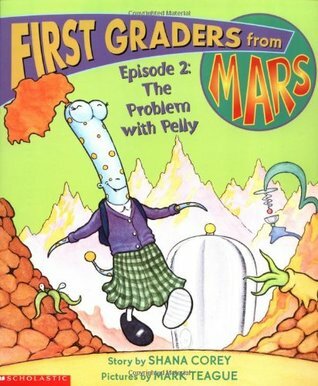 PK-1From Publishers WeeklyThe space age series continues with First Graders from Mars Episode 2: The Problem with Pelly by Shana Corey, illus. by Mark Teague. Pod 1 is expecting a visit from a famous Martian opera singer, and pals Tera and Pelly draw pictures to decorate the classroom. "Your family is weird," Tera says, eyeing Pelly's family portrait; with "fluffernobbins" on their heads instead of tentacles, Pelly's family is unusual. But the appearance of the fluffernobbined diva helps Pelly to accept his differencesThis is really a cute entertaining story and I would use it as a lead in to talking about planets, using this one for Mars. Pelly (Horus' friend from Book 1) isn't a typical Martian 1st grader because she's actually from the moon Phobos. This didn't bother her until her martian classmates start making fun of her fluffernobin (which she has instead of tentacles). A famous opera singer is coming to the class, and Pelly really wants to make a good impression, so she tries to disguise her fluffernobin as tentacles to horrible results. But as it turns out, the famous singer has a fluffernobin too and Pelly learns that being different isn't so bad.Great illustrations. A weird, but cute story about how it's okay, even special to be different. Gotta say that this book didn't hold my interest. I found it unexciting and that it dragged on. Not sure where the kidlets would find it entertaining. Expat/TCK: Pelly is from another planet, and feels weird for being different from the "normal" martians until she discovers that different means special. Shana Corey Mark Teague - Lives in Brooklyn, NY with her husband.